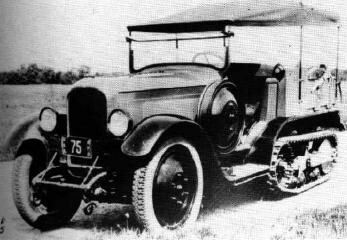 In the 1920's the US Military used the French-built Citroen-Kegresse tracks and the hull of the White Scout Car M2 to develop the M3 as a gun motor carriage. 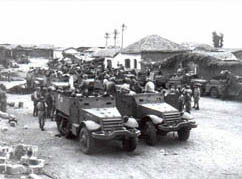 As of 1941 thousands of M3 rolled off the production lines. 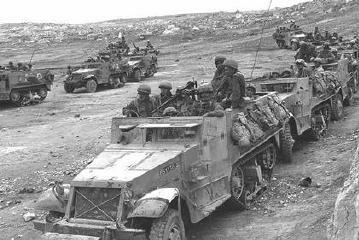 The M3 Halftrack was the complete armored personnel carrier developed in the US from the M2 and M3 Scout car created by the White Motor Company in 1938, which it consequently replaced. 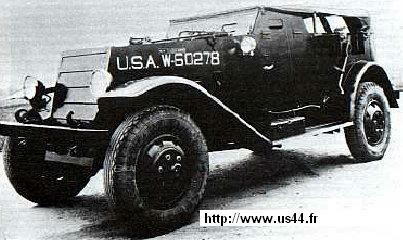 The M2 was in turn based on White's then current commercial truck chassis. 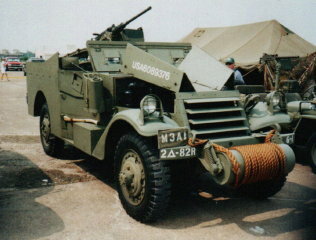 The M3 White Scout car had a roller mounted in front of the bumper that could be lowered to help it not to bog down in soft ground as well as armoured shutters protecting the radiator, which could be opened and closed by the passenger, using a right foot lever. 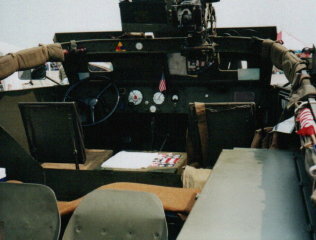 Originally M3's would have a .50 caliber Browning heavey machine gun in the center of the rear quarters but it moved soon to the cab rooftop, while later, in the M3A1 version a pulpit mount appeared and a 0.303 caliber Bren Gun light machine gun in the rear. The hull was elongated and got bench seating varying per model from 10-13 occupants. 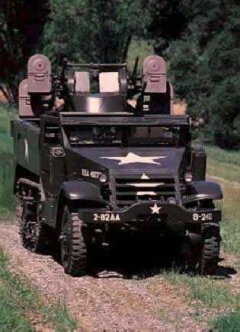 A development of variant of the M3A2 was the M5A1 and had an M49 ring mount for the machine gun and could carry 13 passengers. 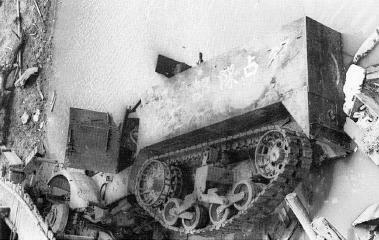 The M5 variant had bodies with rounded rear corners while the M2 and M3 were square and also had a different type of armour fitted, which provided less protection from small calibre AP rounds, due to how the armour plate was tempered. 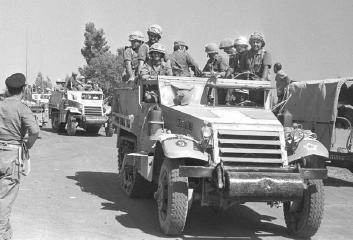 As of 1944 the US Army began to scale back production of halftracks in favor of fully-tracked vehicles. 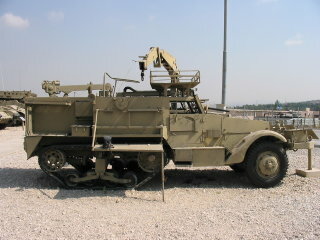 The Israeli Army has bought old halftracks on any European scrapyard they could find and used them refurbished and modernized until the end of the millenium. 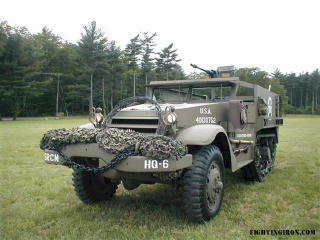 Also other nations continue to use the American halftrack as a battlefield recovery vehicle. Even the Soviet Union received Half-tracks in large numbers from 1942 onwards through the Lend-Lease Act. Powerplant: 1 x White 160AX 6-cylinder petrol engine delivering 147hp. 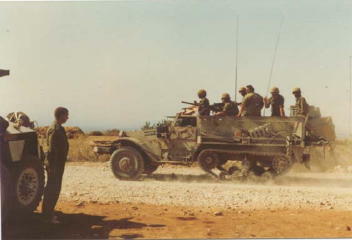 ***Values indicative of vehicle's road range (for self-propelled vehicles) OR maximum effective firing range (for stationary towed-artillery systems). I'm a collector of Dinky Toys and maintain a website featuring my collection. 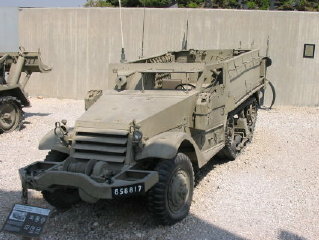 One of the models is the Dinky Toys 822 - M3 Halftrack (1960). I've linked with it a background page including some information/pictures that I found on your website. I would like to obtain your permission to do so. Please have a look at attached pdf.file or check my website directly. Hello Christiaan: Yes you can use the picture. Thank you for asking. I like the historical pictures you have located, keep up the good work. c'est avec un grand plaisir que je vous autorise a utiliser mes photos. Je vous demande juste de bien vouloir faire mentionner le nom de mon site sous chaque photos.